Picture says enough... she still wont leave the house. we have done everything. She wanders around at 6-7pm. Umm that is not a fire hydrant. Thats a fire extinguisher. You can buy those, in case of fires. I don't get it ??? Why don't I see anything when I look at the picture there is nothing there. You have nothing to worry about. That strange light was probably the moonlight shining through the window. I see the ghost. No one knows if it's this person's house of not. Fact is, there is someone or something there. This is fake you can tell its on other sigts I believed it the first time when someone said it was there sister, but this is fake beacause A.Y.S.K. Thats the 15th one I saw. This is not your pic. I have seen it before, on another site. It is a ghost of a old man in a war museum. Yeah I really don't think this is someone's house even.. it looks like a museum/business of some sort. 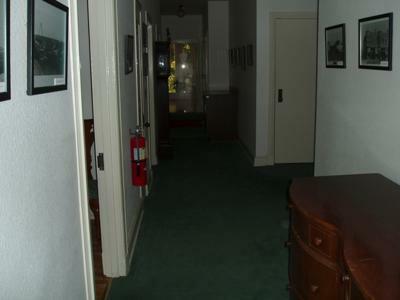 I have a lot of interest in the paranormal, but this does not look real. I don't think that this is a ghost. I beleive that this is a picture of a picture. Sorry. Not being rude but if this picture is in fact yours, it is also on about 6 other sights...some saying its by men, some by women...all claiming they took it in their house. I am so sorry I brought the ghost into your house please forgive me!!!!!!!!! You should check out the history of your house see if anyone has died in the last 50 years around that house. Is she doing anything else? Has she been knocking things over or taking and hiding things? I'm sorry if this is getting into your business but I'm a medium and I like to try and figure things out. After using the high def feature of my computer I zoomed in on the apparition and the surroundings I noticed your extinguisher was out of date maybe that the spirit is trying to tell you that. Wow... if that's not fake then that's really cool. Would you share the story with us? How did you come to take this picture? Where's The Appirition? I Don't See It! Thanks for the pic. Do you think you could fill us in on what's happening and how this came about?